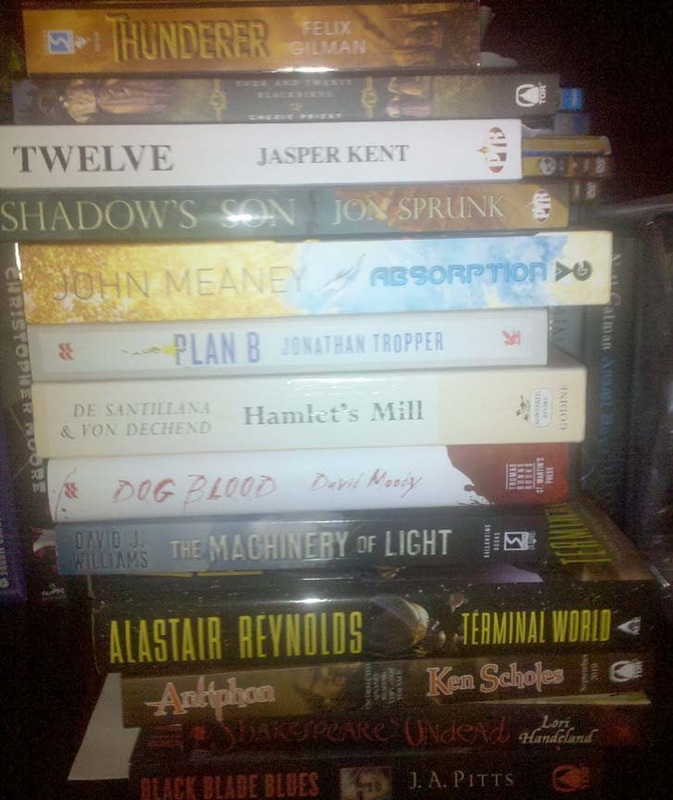 The last couple weeks were pretty quite for books and than all of a sudden I got 7 packages in one day. A couple of those were books I ordered and below few others were nabbed while I was out and about. Thunderer by Felix Gilman - This I picked up at Tor's Steam Salon and while I was there Gilman signed it. Four and Twenty Blackbirds by Cherie Priest - Also from the Steam Salon as I can never find it in store. Twelve by Jasper Kent - My UK counterparts have been talking this Vampire read up for a year now and I'll definitely be partaking of this review copy at some point in the near future. Shadow's Son by Jon Sprunk - This is the finished copy of Sprunk's fine debut (review here), which shows off the art wonderfully. Absorption by John Meaney - Part of my Book Depository order, which is still rolling in. How could I pass up a Sci-Fi series with Ragnarok as the series title? Well I couldn't, so there. Plan B by Jonathan Tropper - I've been itching for some more Tropper after enjoying last year's This Is Where I Leave you so very much. Tropper's publisher is reissuing his books so I snagged this on my last trip to Borders with a coupon. Hamlet's Mill: An Essay Investigating the Origins of Human Knowledge And Its Transmission Through Myth by Giorgio de Santillana and Hertha von Dechen - I've long been a fan of Ancient Mystery type books regarding past civilaztions and lost history. Think Graham Hancock. Dog Blood by David Moody - This is the sequel to Moody's debut Hater sent from the publisher. I'll definitely check it out soon. The Machinery of Light by David J. Williams - The third and final book in the Autumn Rain trilogy sent by the author. Review of the first book is still to come. Terminal World by Alastair Reynolds - Another review copy that I'll be devouring by the end of June. Antiphon by Ken Scholes - Galley of one of my most anticipated series now. If you haven't tried Scholes get off your butts and do it. You won't regret it. I'm anxious to read it now, but I try to hold off until close to publication. Shakespeare Undead by Lori Handeland - I'm a little wary of this mash-up take off after my abortive attempt at reading Abraham Lincoln, Vampire Hunter, but I'm a big Shakespeare fan so I just might try it out. Review copy from publisher. Black Blade Blues by J.A. Pitts - I like Urban Fantasy, but the cover turned me off at first. Having re-read the back cover copy it does pique my interest again as a not your run of the mill UF mixing sword forging with dwarves in a modern setting. Review copy from publisher. Twisted Metal by Tony Ballantyne - Not picture because it just showed up. Another from Book Depository. Did someone say robot war? Both my mailman and UPS man know me by name. Which I live in an apartment so that's saying a lot. The UPS man always feels bad coming to my house but I figure it's all in good fun. I think he sees the piles of books in front of the door and feels bad. How did you get Anphiton already!?! I am dieing to get this read. I am reallly looking forward to the book and the rest of the series. I have loved reading these books a great deal. There is so much going on and it all intertwins together. I hope you enjoy it.